Workshops on 3rd, 4th & 11th of December have all SOLD OUT I’m afraid. 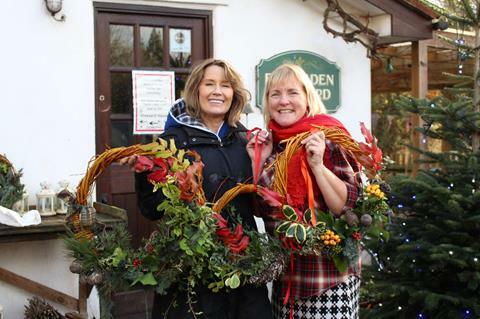 I’m all in a tizz as the fresh willow wreath workshops start this weekend & I want Apple Tree Cottage to look its best. We are busy putting up lights, making mince pies & soup for our guests as it’s the first time I’ve held workshops here at home & I want it to be a great success with more to follow next year. Watch this space for more fresh willow workshops. And so we’ve had a cold snap haven’t we! I’m so pleased I got my new cutting patch prepared before the cold weather arrived here. 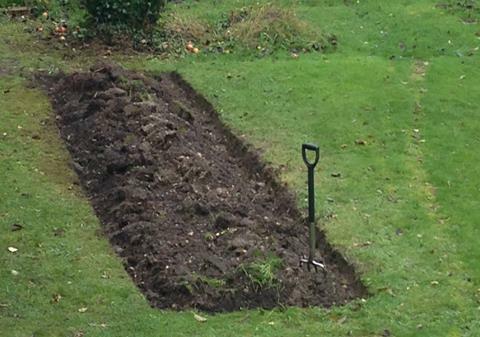 The soil is that much easier to cultivate once it’s had a series of good frosts to break up the tilth. The photo shows nothing yet, but you wait until next year. I’m planting wall flowers in abundance (once the frost has lifted) for a spectacular splash of yellow along with forget-me-nots. They flower around March time (so are good for early bees) & look great cut for a jug indoors with a few sprigs of greenery. We’re gearing up for our honeymoon to Sri Lanka…can hardly wait for the 25th when Mr G & me head off for three weeks to a hot tropical island with botanical gardens, tea plantations, paddy fields, beaches, mountains, trains & LOTS of flowers. I’m hoping to have a new lens for my camera & you should be able to see photos of our trip on my Facebook page Helen Reeley Landscapes if you’re interested. And finally, next year is already looking to be busy garden project wise. I’ll be looking for another gardener when the season kicks off so if you know someone who is looking for part time professional gardening work please put them in touch 07708 643313 or helen@reeleylandscapes.co.uk. I’ve always had great success asking around, in fact Abby, one of my gardeners has been with me three & half years after seeing an advert in my newsletter. Abby has worked for me at the same time as studying for her RHS Qualifications-I’m very proud of her.